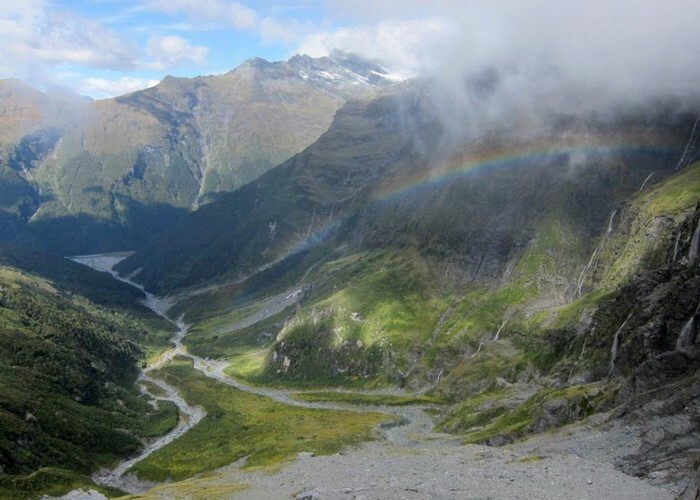 A one and two-half day tramp up the East Matukituki to overnight in Aspiring Flats, with a day trip up Sisyphus Peak via Rainbow Stream. Summer trip only. Easy to coordinate with transport company, or leave your car over two nights. Well described in Moirs Guide North. Looking south from Sysiphus Peak • By apurdam. Licence: cc by. Whittled down from the usual Rabbit Pass/Ruth Flat traverse, due to a poor weather window, this became an interesting tramp since we'd not been in the East Matukituki before. Got dropped in by a shuttle to Cameron Flat, and picked up two days later. After fording the West Matukituki (or using the foot bridge 2km upstream if you want), toddle up the vehicle track and pass the old homestead. Lots of cows about. Might need to negotiate a fence, or you can always find the gate. You might like to drop your pack and take the side trip to Glacier Burn. Whilst the most expansive view of Avalanche Glacier is from the eastern side of the East Matukituki valley at this point, it is interesting to get up closer to it, though views are restricted by the trees somewhat. Soon after the Glacier Burn, the cows peter out and the track gets a little less smooth. Following the pretty East Branch, 7.5 km up from Cameron Flat, you reach Junction Flat. At about 6km there's a nice grassy spot tent site, or continue 3km up the Kitchener to Aspiring Flats and camp there. Expect to get your feet wet again. Rock of Ages Bivvy is probably reasonable in good weather. We used our tent to escape the sandflies. There are one or two reasonable tent sites near the biv. Can visit the base of Turnbull Thomson Falls, or at least head that way, for a bit of an afternoon stroll, if you have the time. Next day, cross Kitchener River and follow the Rainbow Stream north. We had to make one or two crossings to negotiate the banks. When the two main branches of Rainbow Stream meet, follow the ridge up the middle, and at about 900m, head north-east towards Wilmot Saddle. With cloud streaming through Rainbow Col, there is a good chance to catch a rainbow in the valley below you. This part has been avalanched from Fastness Peak in the past, and would be unsafe in Spring and early Summer. Take care not to get too high before sidling up to Wilmot Saddle. Rainbow Stream • By apurdam. Licence: cc by. 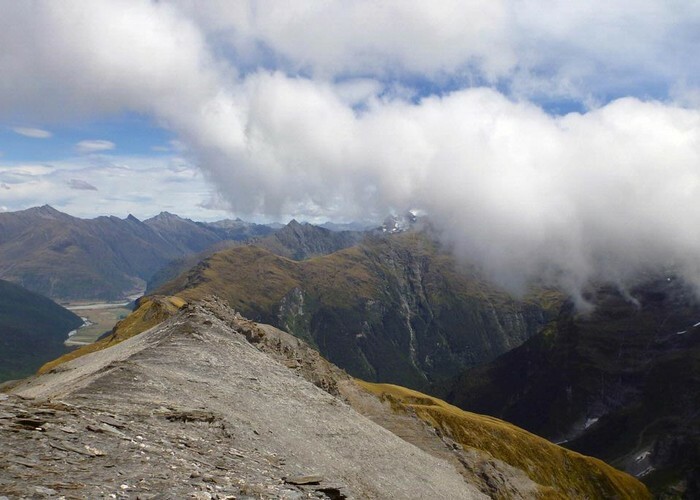 Once on Wilmot Saddle, it is a short steep climb to Sisyphus Peak. The wind can be very strong and blustery up there. Return by the same route, or there is an alternate described in Moirs Guide that follows the southern ridge of Sisyphus Peak. Some scrub bashing will ensue. Added 25 August 2012 by apurdamapurdam. 3 revisions, most recently 29 August 2012 by apurdamapurdam. 288 views in the past year (24 per month).